It's been a couple of weeks since my last blog and in this case that's a good thing. The weather, although temperamental has allowed for lots of climbing. Not always first venue choice but definitely lots of climbing to be had. 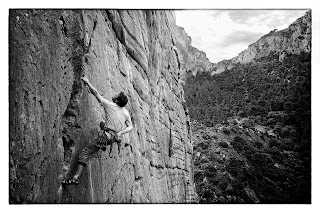 Some of my favourite climbing in El Chorro is on the great big overhanging, jug-fest, tuffa-ville, forearm exploding, super-long endurance test-pieces. As we have had a lot of rain over the last few weeks the big tuffas have been sweating water like the climbers trying to crush them. In fact most of the overhanging rock has been seeping for a while, especially in the mornings before the sun hits it and drys it out for us. So I've spent a lot of time over the past couple of weeks on more vertical offerings in the area. This style of climbing suits me better at the minute as I can compensate for my weaker arms with a bit of technique and footwork. And I've also made use of the mileage achieved in the first few weeks to climb smoother and more confidently. 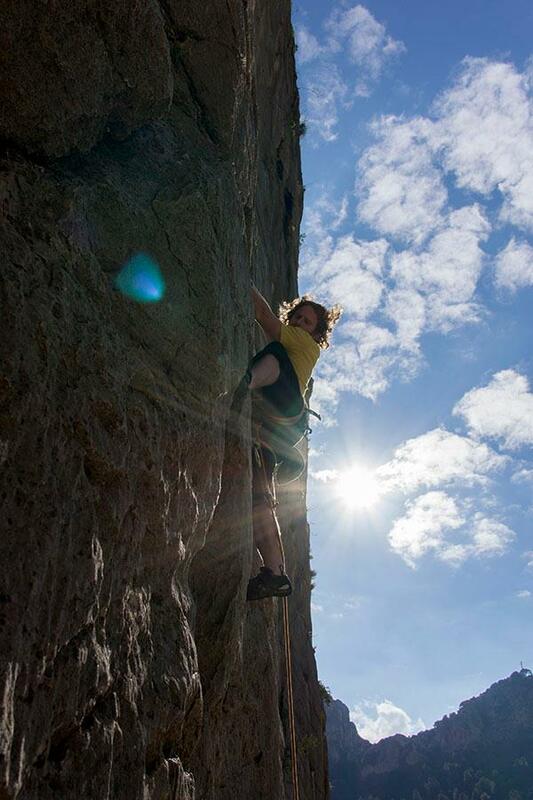 At least until I confidently and smoothly fall at the crux on some of the harder routes. The search for vertical climbs has taken advantage of some fantastic sectors in the area with trips to Escalera Arabe and its beautiful views over the valley. Photo courtesy of Patrick Pearce. And a great excursion to El Polvorin, through the gorge. I've been to El Polvorin once before a few years ago but got put off by the difficulty of my supposed warm-up route. El Polvorin offers several high quality routes, all super long on clean vertical rock, in a beautiful setting. The warm-up is a 35m, 6a+ with a bit of a tough start which had me pumped for the rest of the route and never truly relaxed. Off-putting, considering all the other climbs are at least 6c. Sticking with this crag definitely pays off. We moved on to climb Pilier Dorada, Generacio spontanea and Habitos de un perturbado irrerdiable, each route worth the stars and top 50 accolade they receive and well worth the longer walk to get there. A day spent on-sighting at a top venue like this is great ground work for getting on other longer routes as it offers you fantastic opportunity to focus on your route reading, identifying rests and crux sections. Cementing the habit of climbing to the rests or identifying where the clipping hold is or where to push your hardest, especially on routes at your on-sighting limit creates the habits that help you succeed on harder and harder on-sights and pushes you up the more difficult projects. A lot of climbing is down to arm and finger strength but sometimes it's this strength that can be a disadvantage, especially when we get closer to our max. 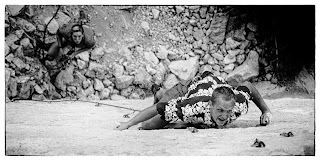 More and more I use the term you're just too strong when I try to give advice to climbers. Learning to let go a bit and climb at your weakest brings you closer to the smoothness and effortless movement that allows you to arrive at those harder cruxes fresh and with plenty of power to push through. Tom Ireson on Ace Ventura 8a/+. Prize winning photo courtesy of Patrick Pearce. With that in mind, today we're going to start our onslaught on Talibania F8a. A project Darren was trying last year and we hope to send on this trip. 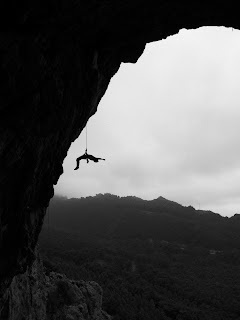 Not exactly my style, especially having spent the last few days on vertical rock, the over-hanging nature of this route will get me stronger and get me focusing on how to not use that strength until it is absolutely necessary. All pictures are courtesy of Patrick Pearce. The difference between my point and click approach and his understanding of the intricacies of creating something special and beautiful are so evident in the atmosphere and emotion he is able to portray in his artwork. His pictures include the Petzl competition winning picture of Tom Ireson on Ace Ventura (above). The great news is that Patrick is in El Chorro for the season and you can hire him for the day.